Rope barriers are an elegant way to say “no entry!” When other barriers are too severe in appearance, rope post barriers come to the rescue. The type of rope needs to be carefully chosen depending on where it will be in use. Sophisticated settings need equally sophisticated rope. This is where our rope by the metre comes in. With a soft, braided yet functional and strong design, you can buy this rope in any specific length. A choice of four colours ensures that you get your rope to match your interiors, too. Simple, strong, elegant and affordable: these are the catchwords of our rope by the metre. Posts and ropes appear as a popular accessory in a wide range of places. 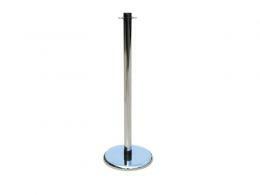 A common place to see post and rope is outside restaurants or nightclubs to help with queue control. Our collection of posts and ropes can suit any occasion. 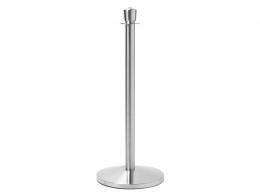 We have classic posts for Museums, Churches or Golf Clubs. 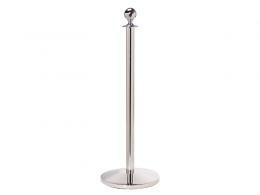 Our Deluxe posts suit Theatres, Opera Houses, Hotels, Country Clubs or Stately homes. Our British rope, braided Red, White and Blue is great for any sport or patriotic event. We sell soft twisted rope, available in four different colours. Accessories include open and spring closure hook ends, sign holders and wall fittings. Where Can I Use This Rope? This rope is typically used to form rope barriers. Its ideal for locations where barriers have started to look tacky and need replacing. Any place that requires rope barriers on a regular basis will enjoy this product. Banks, Opera Houses, Theatres, Hotels, Nightclubs, Discotheques, Art Galleries. 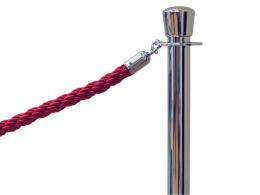 All locations that use rope barriers to control crowds, queues or restrict access. Anywhere there is a need for new rope, this product will fit perfectly. Virtually anyone concerned about security will find this an invaluable product. It helps in queue management, crowd control and access restriction. Its ideal for those working in the line of security or protection services. Or anyone who needs a semi-permanent, functional, yet elegant physical barrier. Getting your rope by the metre will always cost less. There’s no need to worry about spending on hooks or stanchions that you already have in your possession. Buy your rope by the metre and have the ends fixed to the hooks you already have. Your new rope post barrier is ready to deploy in a matter of minutes. Rope made from from soft, braided material. 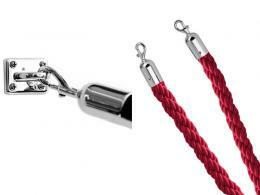 This product is available as plain rope in four different colours: Black, White, Red and Blue. 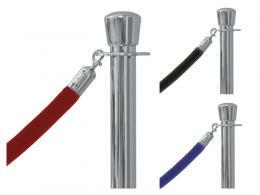 Buy any length of rope you need, you can customise your rope post barriers to your exact needs. The Workplace Depot offers a standard one-year warranty on all parts and labour. Our rope complies with local council and government regulations. Ensuring the safety of your and staff and customers. Even famous paintings like the Mona Lisa get protected by rope barriers. True, bullet-proof glass likely plays a bigger role in protecting this half-smiling celebrity. Yet, rope barriers ensure that enthusiastic art lovers don’t get too close for comfort. The comfort of the curator!